Vanilla Garlic: Great Big Vegetable Challenge - The Book! 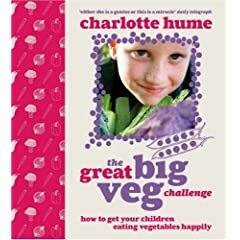 You all know I love Charlotte, she's a riot and sharp as a knife when it comes to creative ways to get veggie-phobic kiddies to eat their greens. As you may have read, she has finally gotten through the alphabet of vegetables, and along this amazing journey has ended with a book deal. It's quite a great resource. A lot of the popular recipes from the blog, plus some new ones, all in one delightful and colorful resource. She took the pea-frightened Freddie, and made his a culinary celebrity and spokesperson for all things farmed from the ground! I, personally, have a bit of a personal pride in this cookbook of hers though. Two recipes are inspired from recipes here. The Petit-Pois Muffins and the Zucchini Muffins. Both started out here as cupcakes, the Sweat Pea Cupcakes and the Zucchini Cupcakes. In my opinion, I think she made them a bit better than I did originally. The Petit-Pois is a lot fluffier and has a fresher personality than my original using butter, creme fraiche, milk and self rising flour. So thank you so much Charlotte and Freddie! I'm getting a second copy for my nephew David, never to young to learn to start cooking and this masterpiece is a great first cookbook for any child! I know what a great feeling! I did the "girlish" squeal too with the YUMO BOOK and our recipe! Oh yah I'm a girl! I'm so glad you blogged about this as I hadn't heard about the book deal yet. Will have to check it out! And Freddie was very grateful that there was a cake recipe or two in the Great Big Veg Challenge. He would have liked many more cakes. Thanks for posting this, looks good. Anyone who inspires kids to eat ceggies is a winner in my book. congratulations, garrett. the sweet pea cupcakes were genius.